It is common when exploring the rich intertidal zones of south Thailand to become so absorbed in the life between tides that one rarely looks up. 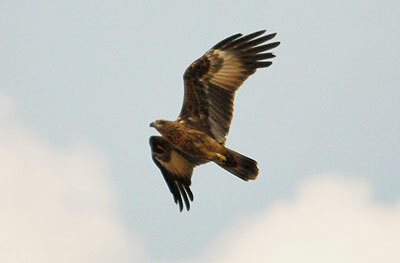 But if one to do so along most any coastal area there is a good likelihood of spotting a Brahminy kite. This medium sized member of the hawk family is a common resident of the coasts, mangroves and larger rivers where it scarvenges for food. While not really an intertidal species as such, it is an important raptor which preys on floating debris washing into tidal waters. The adult has a distinctive white head, nech and breast contrasting with a bright chestnut underwing and belly. Wing tips are black in both adults and juveniles. The Brahminy kite is a resident in south Thailand, and while common along the coast has been much reduced in number further inland.